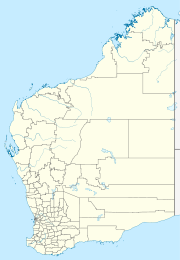 Bonnie Rock is a small town in the Wheatbelt region of Western Australia. The town was once the terminus of the railway to Beacon. The name of the town originated from a rock formation that is situated close to the town that was named by a sandalwood cutter. The townsite was gazetted in 1932. A short lived newspaper in the 1930s included the name of the town in its title. The Russian adventurer Fyodor Konyukhov broke the record for the fastest circumnavigation of the Earth in a hot air balloon in just over 11 days, landing safely near Bonnie Rock about 4.30pm (local time) on 23 July 2016. ^ Australian Bureau of Statistics (25 October 2007). "Bonnie Rock (State Suburb)". 2006 Census QuickStats. Retrieved 2 October 2008. ^ Western Australian Land Information Authority. "History of country town names – B". Retrieved 2 October 2008. ^ "CBH Receival Sites - Contact Details" (PDF). 2010. Archived from the original (PDF) on 18 March 2012. Retrieved 31 March 2013. ^ "Russian adventurer Fedor Konyukhov breaks world hot air balloon record, lands safety in WA". Retrieved 24 July 2016.